choice to find the balance, to meditate, but also to celebrate your wedding in Sardinia or to explore the territory in the search of hidden coves and wild corners. Only 50 Km from Cagliari, in Chia area, in the extreme south of Sardinia, the Lighthouse "Faro Capo Spartivento" dominates the landscape from the homonymic promontory. Surrounded by a still wild and unspoiled nature, where the Mediterranean scrub grows with its splendid colours and scents, the Lighthouse stands on a cliff overlooking the sea, reachable by a dirt road closed to the public. An exclusive location to celebrate your wedding in Sardinia! 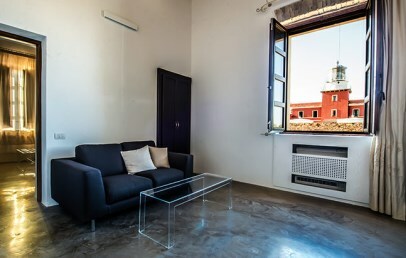 Built in 1856 by the Italian Navy, on an area of 600 sqm, the Faro Capo Spartivento accommodated the family of the lighthouse keeper up to the 80s. Today the Faro (lighthouse) and Residenza Semaforisti are Luxury Guests Houses, keeping its charm and its original nature of the lighthouse, which illuminates the sailors way for 150 years. Peculiarities – The Faro Capo Sparitvento has been renovated with a panels system using the solar energy to heat water, and also with a phyto-purification waste water system, which reuses them for the garden. External area – In the 3000 sqm back garden, a centuries-old olive tree stands in the middle of a large lawn; a 12 m fireplace with a lounge and a barbecue area. In the central raised area, eight crystal gazebos of 16 sqm each, where guests can dine enjoying the splendid sea or hill view. In front, over the amazing sea, are a beautiful infinity pool and two Jacuzzi nestled into the wooden platform of 200 sqm. All around are loungers and an elegant lounge with white leather sofas and parasols, ideal for breakfast or lunch or just a drink with breathtaking view. Internal area – The entrance is a 120 sqm big area, embellished with particular red chandeliers made of Murano glass and offers a dining room and different cosy lounges. A cast iron spiral staircase connects to the cellar (once an old underground tank) and another staircase leads upstairs to the tea room with fireplace with big coffer used as a library, the four Suites and an office room with PC, ADSL, telephone, stereo music system. Another spiral staircase leads to the second floor that opens up to the roof top terrace: guests can relax on the four-poster bed for a sunbath or at night, to be enchanted by the starry sky. A separate building completely renewed in 2016, located a few meters behind the lighthouse with four Suites and one double room. Born from the restoration of the old houses of the lighthouse keeper "Semaforisti", that once where in charge to guard the lighthouse. The "Residenza Semaforisti" is a U-shaped building with a courtyard with a central fireplace; it features an infinity pool and a nineteenth-century cistern used as a wine cellar. From here the gaze is lost in the beauty of the Nature from the west coast up to Capo Malfatano. All Suites are spacious with 55 to 70 sqm surface and are characterized by a design, that combines traditional elements with modern lines of design, enriched by antique pieces of furniture. The Faro Capo Spartivento consists of the building of the "Faro" and the new building "Residenza Semaforisti" lighthouse keeper lodge. The FARO offers only a few charming accommodations, perfect for an exclusive and refined stay. 2 Suites Hill View (Classic Suite) – with approx. 35 sqm, with two zones, the living area with sofa and an LCD TV and the sleeping area. 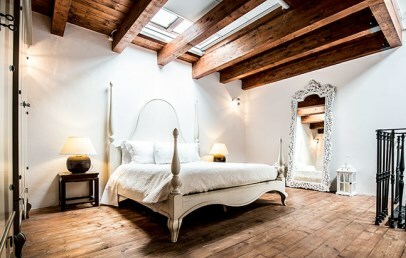 One of the Suite is furnished with a bed in Provencal style, the other Suite has a wrought iron four-poster bed. Moreover in a annexe building, a few steps away from the lighthouse, are two mini apartments – the Classic Garden Suite with 50 sqm surface and distributed over two floors. They offer a living area on the ground floor and the sleeping area on the first floor. These apartments are advisable for a couple with one child. All rooms have double bed, bathroom with heated towel rail, full length mirrors, fridge, LCD TV with DVD and stereo, air conditioning, safe, high-speed internet connection, bed linen, towels, bathrobes. Following services are included: cleaning, a cook, waitress, shuttle to the beaches of Chia. 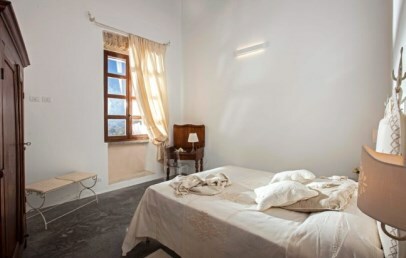 Semaforisti Standard – double room with approx. 18 sqm surface, bathroom with shower and panoramic view. Semaforisti Suite – from 55 to 70 sqm, bathroom with shower and panoramic view, a living area with couch and TV and a sleeping area. All rooms have double bed, mini fridge, LCD TV, air conditioning, safe, Wi-Fi internet connection, bed linen, towels, bathrobes. Following services are included: cleaning, a cook, waiterss, shuttle to the beaches of Chia. 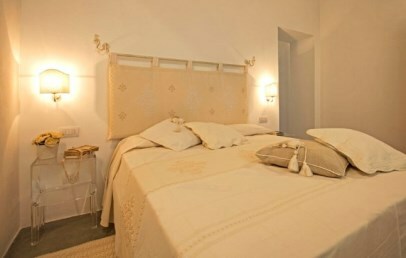 Guests of this accommodations have only access to the pool and common areas of the "Residenza Semaforisti". 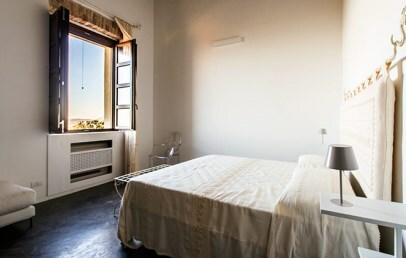 The Faro offers a 24 hours ADSL broadband internet connection and at the Residenza Semaforisti Wi-Fi connection in each room and transfers to/from parking at the arrival and departure day (900 m distance). Further more on request and subject to charge are a chef, butler service, laundry service, babysitting, transfer service with driver, excursions, massages and beauty treatments, rental of DVDs/projector/screen, single bed, baby crib. For golf lovers, only approx. 10 minutes drive, is the golf course Is Molas Golf Club. Suite with a bed in a Provencal style, or if you prefer, canopy (upon availabilty). They are characterized by stone-vaulted ceiling and embellished with precious chandeliers made of Murano glass. Spacious, elegant and unique, the Suites consists of a living area equipped with Fürstenberg sofa, a LCD Tv, a high speed internet connection and, on request, many additional services (personal chef, waiters, childcare, babysitter and chauffeur). The bathroom has a large glass-shower-box, bathrobes. The suites offer a relaxing view of the surrounding nature, untouched and wild, from the window. Total white bedroom with a Fluttua circular suspended bed by Lago Corporate. It is characterized by stone-vaulted ceiling and embellished with precious chandeliers of Murano glass. Spacious, elegant and unique, the Suite presents two bordering glass windows between the room, the private bathroom and the huge walk-in closet. Available a internet connection and many additional services (personal chef, waiters, childcare, babysitter and chauffeur). 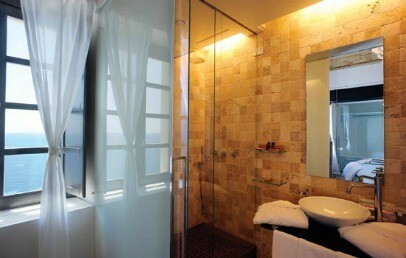 The bathroom have a large glass-shower-box and bathrobes. The suites offer a spectacular sea view from the window. Located in an annexe building, the two Classic Garden Suite have a private entrance overlook the backyard. They are built on two floors linked by a cast iron spiral staircase. These cosy apartments are advisable for a couple with one child. Precious chandeliers made of Murano glas embellish both the sleeping area on the first floor and the living area on the ground floor, equipped also with sofa, a LCD, a internet connection and, on request, many additional services (personal chef, waiters, childcare, babysitter and chauffeur). The bathroom have a large glass-shower-box, bathrobes. These rooms and suites are located in the lighthouse keeper lodge, just behind the lighthouse and offer a nice view over the panorama. 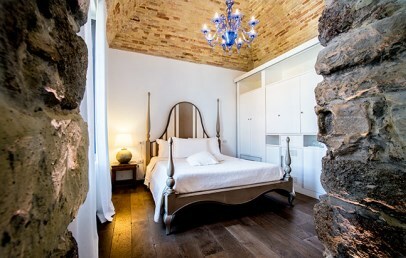 They have a surface of 18 sqm and are modernly furnished with some ancient pieces of past life, that gives a special charm. The bathroom has a shower, hairdryer and modern amenities. The guests of this accommodations have only access to the pool and common areas of this lighthouse keeper lodge. 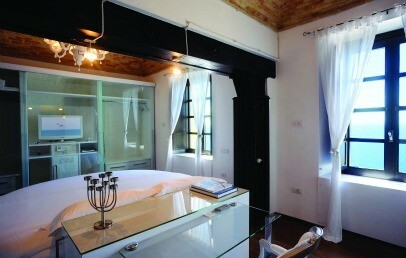 These Suites are located in the Residenza Semaforisti (lighthouse keeper lodge). 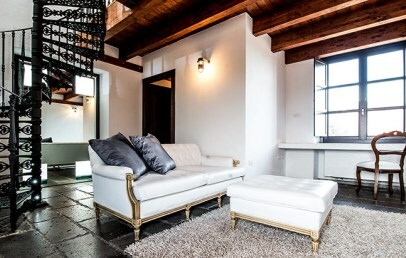 They have a surface of 55 to 70 sqm and are modern furnished with some ancient pieces of past life, that give a special charm. There is a living room with couch and television and a separate bedroom. 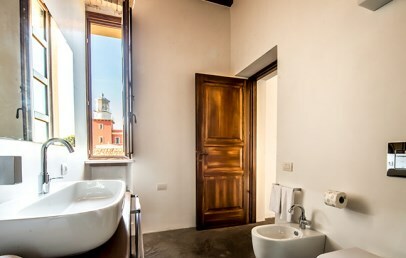 The bathroom has a shower, hairdryer and modern amenities and from the window is a lovely panoramic view. 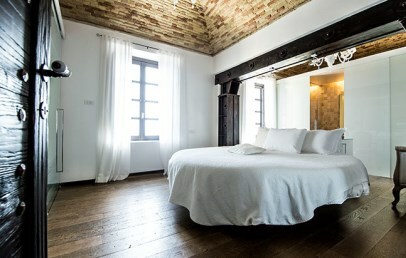 The guests of this accommodations have only access to the pool and common areas of this Residenza Semaforisti. You can book your “Secret Room” with a special rate: the reservation of the Secret Room includes a special discount, but does not allow you to select the room typology.